Just shy of our second month as man-and-wife, Vlad and I got to celebrate our 9th year together. After a honeymoon full of unbelievable food, it was only appropriate that we partake in one of Orlando’s best restaurants. Vlad booked Victoria & Albert’s for November 30th at 9pm. 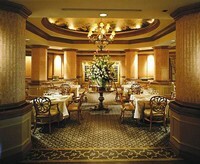 Victoria & Albert’s is located in the Grand Floridian Resort in Walt Disney World. This is not a restaurant for the family. It is upscale, expensive, and truly an event. The menu is a seven course prix fixe for $115/guest. There is also a wine pairing for $60/guest which we didn’t indulge. Although you have several items to pick from I am sharing what Vlad and I ate. We both ordered Colorado Buffalo Tenderloin for our first appetizer and it was delicious. Vlad decided on the lamb with wild mushroom ragout for his second course and really seemed to enjoy it. I had the quail which was presented beautifully. The next course really blew the others out of the water. We both ordered the scallop with salsify and cauliflower. It is difficult to describe this. The scallop was so tender and buttery and was served with a froth of cauliflower that was divine. Truly unbelievable. For dinner, I ordered the short ribs while Vlad splurged on Australian Kobe beef tenderloin. Both were outstanding but I could definitely tell why someone would pay the extra $25 for the Kobe. I got the gelato for my next course and Vlad was brave (as always) and got the cheese plate. For dessert Vlad got the dark chocolate mousse pyramide and I had the chocolate souffle. Overall, it was an amazing experience. It is definitely worth dressing up and indulging. The service is great and much like our experience at Club 33 – the staff is really personable and friendly. They aren’t pretentious and will gladly make suggestions when asked. If you don’t know something on the menu they are there to help. Vlad was asked to speak at Connections in Las Vegas and I tagged along. This was our third trip to Vegas and we have definitely found what we like to do. Not being gamblers in Sin City leaves lots of time for recreation. Vlad was staying in Mandalay Bay when I joined him on Thursday. It was beautiful. The rooms were ridiculously nice and the bathroom had a huge tub and separate shower. I would recommend it to anyone. We did have to switch hotel rooms and decided to try Excaliber. It fell short of my expectations by a long shot. It seemed more like a motel but it served its purpose just fine. Friday night we saw our second Cirque du Soleil show, O. I was completely enthralled. This is a water show and very different from Mystere which we saw a year ago. The stage was incredible and involved raising and lowering portions of flooring which would fill or empty the stage with water. Often performers were often on dry land and seconds later were standing in feet of water. Instead of exiting the stage to the left or right, many people and props simply disappeared down into the stage. Although Vlad still preferred Mystere, I was captivated by O.
Saturday we headed out to see yet another Cirque show, Ka. As you walk into the theater, it is impossible not to be wowed by what you see. The stage itself is floating and is rotated to change scenes. Ka is the first show that we have seen that was an actual story. It begins with a brother and sister that are separated during an attack. It follows both of them on their adventure to survive. If you are more interested in seeing a performance that an odd clustering of acrobatic amazement, this is the show for you. 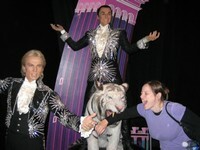 Vlad and I were less pleased when we could compare them to Mystere and O. Nothing could have spoiled our final show. Our last show was La Reve at the Wynn. By far it was the most incredible. The performance is based around a series of dreams that the main character is having. These dreams are all amazing, seductive, and inspiring. Both Vlad and I walked away delighted. We both agreed that this was the best show we had seen. The theater is circular and the stage in the center was very similar to the O stage. There was a mix of swimming and diving with land performances. The side show was fantastic too. This would definitely be my recommendation if you are only going to see one show. Check out all of our Vegas pictures here.